If you're a student who's ever wanted to live during Oregon's pioneer era, one of Philip Foster Farm's summer camps might interest you. This year, the National Historic Site in Eagle Creek will offer three options for campers: the Living History Day Camp, the Girls Finishing School and the Little School House Camp. "It's a completely unique camp experience," said Philip Foster Farm programming director Jennifer Goldman as she discussed the three summer camps. "Nowhere else do you get to dress up in costume and experience pioneer life. If you have a kid who likes history, it's an incredible experience." In 1840, Philip Foster and his wife, Mary Charlotte, established a 640-acre farm in Eagle Creek and hosted numerous pioneers traveling west on the historic Barlow Road along the Oregon Trail. Their property featured a store and places for weary travelers to stay. 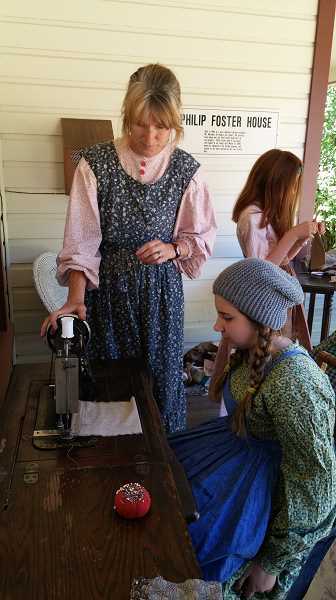 During the farm's Living History Camp, participants wear period clothing and participate in sewing, craft projects and other activities from the era, such as blacksmithing. Additionally, on some days attendees will make lunch using the same methods as the pioneers, including using a wood stove or over a campfire. Campers will also learn songs and dances from the pioneer period and go for hikes. The Living History Camp is open to those ages 7-12 and is scheduled for June 25 through 29 or July 30 through Aug. 3. The cost is $175 per child, with a $50 refundable deposit for the period clothing. The Girls Finishing School was designed for those who have outgrown the Living History Camp, but still wish to be a part of the farm. Participants will learn about etiquette and dress of the pioneer era during the three day event, which will culminate in attendees acting as hosts during the farm's annual Mary Charlotte's Garden Party event. "There's an intensive historical focus," Goldman said. The Little School House Camp is new at the farm this year and is designed to combine the historical camp experience with academic assistance in various subjects. The camp is available on a weekly or daily basis Tuesdays through Fridays during July. It will feature academic enrichment and pioneer crafts and skills. The cost is $40 per day, $150 per week or $500 for a four week session. "It's less of a camp and more of a summer experiential learning experience," Goldman said. For more information about any of the camps and to register, visit www.philipfosterfarm.com. Goldman encouraged anyone interested in any aspect of history to attend one of the camps this summer. "For anyone interested in crafts, cooking — there's something for everybody," she said. "If you like history, we definitely have something for you. If you've always wanted to crochet, we'll do that." She noted that most campers return the following year. "When else can you cook on a wood stove or be a blacksmith at 10?" she asked. Though Philip Foster Farm has several events during the summer — including Mary Charlotte's Garden Party and a pioneer food celebration — Goldman said the summer camps allow attendees to experience the farm in a different way. "You're there every day. Feeling the rhythm of an entire day has a different feel to it," she said. "It's not just a visit to the farm. You're a part of the operations at the farm. It's not just going through the house. You're going to be able to talk about the house."